Here at Liz of Oz we only think of you and what you need except when we are thinking of ourselves. What you need is to know there are only 77 days left of winter left this year. We are not using scientific measures, or calendar measures, but emotional ones. If we can get you well into March, you’ll be fine. The following categories will help nurse you through this difficult time. I visited my grandma today at the “Lost Minds” unit. She got to pet a dog, which is her favorite thing in the world. I kissed her one time, and she whispered for me to come back so she could kiss me, and asked me to kiss her again. Something beautiful here: Blues and browns and golds here are incredible. 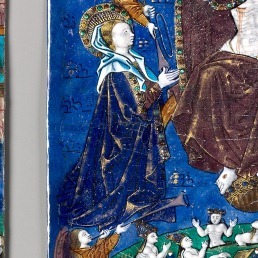 Enamel from France in 1500. Small portion pictured here. I like that word, Matri. Nicely done. And happy new year.